The Back to School season is officially upon us. I’m joining together with some of my favorite bloggers to give you a bunch of tips to help you sail into the new year smoothly! Maybe it’s because I’ve moved offices or classrooms every single year except my first year and have spent hour after hour after hour getting things set back up, but, my first tip is to take the time now to get organized. Every summer I spend time trying to get as organized as I can. There’s always an area of the room that needs to be tackled, or in my case, I’m trying to get my new room just right. Once the school year starts, things are in a constant motion and I’ve never found time to go back and tackle that To Do list that always gets continued over from summer. Getting organized now also helps to get things off on the right foot. One of my biggest goals this summer was to put together a Teacher Toolbox for my teacher supplies. In my new school I won’t have a traditional teacher desk. There’s a teacher space, but it doesn’t really have drawers, and I need a place for my markers, staples, thumb tacks, and whatnot. I’m a teacher supply hoarder so I definitely need something to contain all of my goodies. I bought this organizer from my local hardware store. I knew I needed a ton of little drawers but I wanted some big drawers too. I also loved that this already came in black so I didn’t need to worry about spray painting to keep it with my black and white scheme. I then made labels to put on the drawers. Because the drawers aren’t flat, and the big ones have center tabs so you could divide them in half, I attached my labels with tape on the outside. I LOVE the way it turned out! I made my labels colorful, but I’ve also made a set that is completely black and white in case you need it. I also made this completely editable. That way, if you want to change some of it, you can do it straight in Powerpoint. All of the directions for font and color matching are in the file. Just click the image below to head to my TpT store to download it for free. In my countless room changes I’ve discovered something. If I don’t start the year giving every piece of paper a specific and logical place, they’ll multiply overnight and suddenly every surface is covered. I realize I’m exaggerating, but I truly have had years where the stack of papers on my desk never gets emptied and has gotten out of control. I’ve also had years where the stack of papers never really happened. The trick was starting the year giving everything a specific place. Last year, my kids had a hard time turning in their work into the correct slot in my mailbox system. I’m going to use that mailbox system myself to help me stay more organized. For the kids, I decided to make a new system this year that was more visible. I bought these two Sterlite drawer systems in black. Why did I buy two different ones you ask? Well, it’s because the only thing different from them is the top, and when they’re on high shelves and you’re short, you don’t notice the difference until you get home. I then created these labels for the fronts of the drawers. Two will be for turning papers in and the other will be for lined and scratch paper. The same size labels work for both. Just like the Teacher Toolbox labels, I’ve provided everything in Powerpoint so it’s completely editable to work for you. 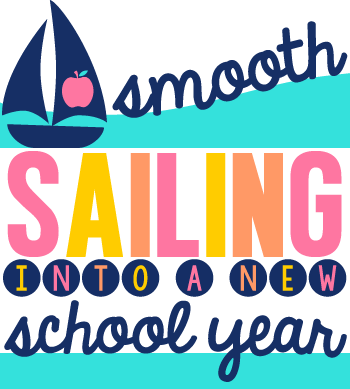 You’ll want to make sure you hop through each person in this hop so you can read some amazing tips and strategies for starting your school year smoothly. Use the linky below to hop through! Thank you! You make adorable things! This is very generous of you. Love all the bin labels! I got mine from Menards in town. It is plastic and lightweight. I think it'll look great with your spiffed out rocker! I love those labels. Perfect! I agree with you about organization. Every year I start out great, then I don't know what happened ;). I know his will make my room look so cute as I try to be more organized! Thanks again for the share and opportunity!